Casa Maya stands out amongst Las Catalinas beach vacation rentals for its devotion to the civilization it takes its name from, as its textiles, hieroglyphics, and general décor embody and pay tribute to Mayan culture. Spacious, warm, and rich in wood and dark leather, this Guanacaste beach house is great for families and groups of friends who want a cultural feel while enjoying the many delights of the sea and the tropics. With a personal flair all its own, comfort and heritage meet in papaya, dark salmon and wood brown hues, giving its ample living room, the integrated kitchen and the dining space a lush feel, complemented by rustic wood furnishings that give this Costa Rican vacation villa the sense of a cozy cottage, though one featuring a delightful private terrace and plunge pool. The master suite features a king bed and a balcony where the ocean peeks at you, while secondary rooms feature a queen, a bunk with two full beds, and a trundle. All bedrooms have an ensuite bathroom and each gives a unique feeling of tradition, with rustic furniture and chandeliers lamps recalling the colonial homes of yore. Add an independent apartment with a master suite featuring a king bed, a living with two sofa beds, and a kitchenette, and Casa Maya is particularly versatile for large parties. This vacation home in Costa Rica accommodates up to fourteen guests. Children are welcome. Embrace the comfort of a private luxury villa in a picturesque setting and experience the wonders of Costa Rica the way it’s meant to be. 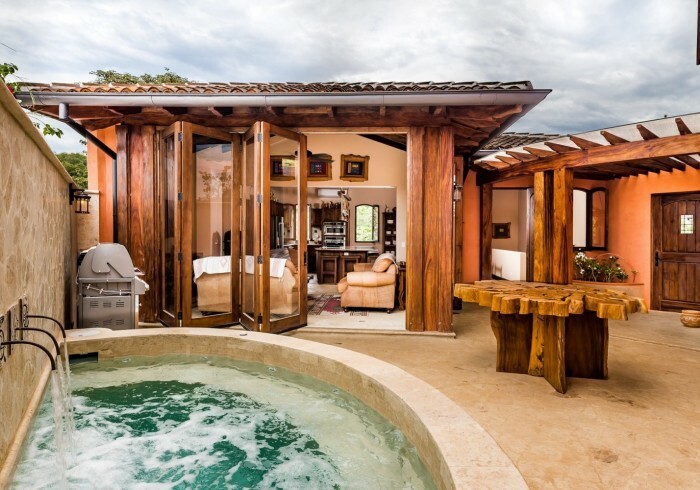 Enjoy the privacy and quiet of your own home in Guanacaste with daily housekeeping service and let our dedicated concierge team help plan your vacation in paradise is a resounding success.